The following post is my longer analysis of New York City Transit’s bus action plan. I originally wrote this up for Gotham Gazette, and you can read it here. I’ve expanded it for this post with some additional deep-dives into the plan itself. In the Big Apple’s transit circles, Andy Byford has quickly become the hottest U.K. import since the Beatles. New York City Transit’s new president, brought in this winter from his job as the head of the Toronto Transit Commission, faces the unenviable task of fixing the city’s ailing subway system and restoring faith in its vital transit network. Just three months into the job, Byford is moving at a breakneck pace, and on Monday, he unveiled an ambitious plan to speed up New York City’s snail-like local buses and fight the tide of declining ridership. The New York City bus system is a curious thing. It is notorious unreliable with buses that crawl through city streets stopping every two or three blocks and with average speeds that barely exceed eight miles an hour. With infrequent and unreliable service, ridership has declined by nearly 10 percent since 2012 and 15 percent since 2002. Still, over 2 million riders a day rely on the city’s buses, and the bus system needs to be fixed. So what exactly is the plan? For now, it is an aspirational approach to better bus service with a 28-point agenda. The images embedded are from the plan, and I have added commentary as appropriate. Byford wants to redesign the network by optimizing routes based on ridership needs while eliminating some stops to speed up service and expand off-peak bus frequency. Notably, he wants to expand off-peak service on what he calls “strategic routes” to better provide the last-mile connections a reliable bus network can provide. These types of redesigns require MTA action (though DOT will have to be a partner in improving street design). Here, NYC DOT takes on a more important role. Byford wants to implement infrastructure upgrades that prioritize buses over other vehicles, including dedicated lanes and a signal prioritization system that allows buses to hold green lights or shorten reds. He wants exclusive busways — proposals that have more or less died in the face of driver opposition in recent years — and he will need DOT’s help. He calls for NYPD cooperation and effective traffic enforcement to keep buses moving through dedicated lanes. Importantly, he proposes a faster boarding process, currently a main source of delays. 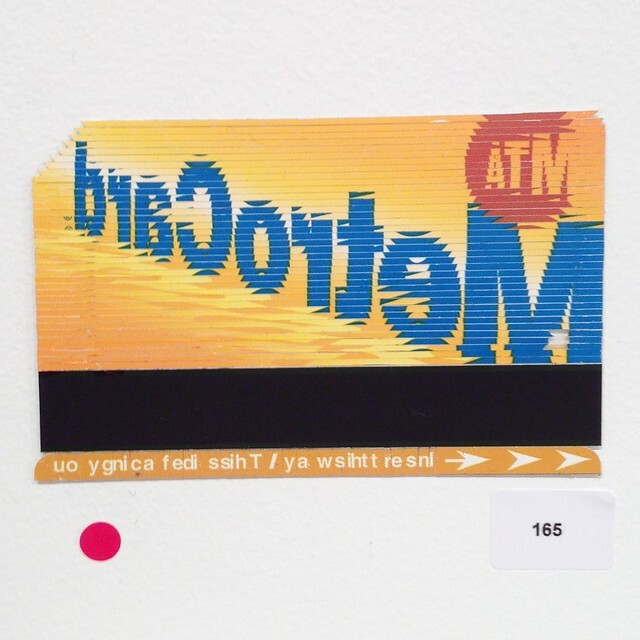 To reduce bus dwell time — the minutes a bus spends sitting at a stop while riders dip their Metrocards or scrounge around for $2.75 in nickles, quarters, and dimes — Byford suggests all-door border, similar to London’s bus system; a tap fare payment card; and cashless bus fares. The final parts of the plan involve customer-focused improvements including more real-time bus countdown clocks, redesigned system maps, and more bus shelters along with some clean-tech buses to replace New York’s current gas-guzzlers. And to that end, except with respect to the all-door boarding and other technological upgrades to the buses themselves, Byford is now almost a bystander as he has shifted the onus to the city Department of Transportation, the NYPD, and Albany lawmakers to work together to realize his vision of a better bus network. But it’s his plan, and he will have to be a forceful advocate for it. Still, let’s look at the other players involved. Let’s start with the city’s Department of Transportation. Since DOT controls the city’s streets, any changes to the way street space is allocated will have to start with DOT. Thus, additional bus lanes, dedicated bus corridors and the queue-jumping benefits of signal prioritization require DOT buy-in and support, and so will reducing the number of bus stops and changing street design to better support bus infrastructure. NYC DOT Commissioner and MTA Board member Polly Trottenberg voiced support for the plan during Monday’s meetings, but her boss, the mayor, a reluctant and infrequent transit rider who virtually never takes the bus, will have to be a forceful ally supporting these changes. Finally, the elephant in the room is the cost. We do not yet know how much the bus plan will cost. It relies in part on moving pieces that are partially funded (such as a new fare payment system) and others that are not, and it will again be up to the governor to champion transit improvements in New York City so that they receive adequate funding. Facing the pressures and, more importantly, the headlines of a primary challenge, Andrew Cuomo has lately embraced certain positions he has rejected in the past, and mass transit support should be one of them. Perhaps, then, the time is right for the city and state to prioritize bus travel over car traffic. A recent report by NYC Comptroller Scott Stringer highlighted the ongoing problems with NYC’s bus network. New York City’s subway crisis built very slowly over the past few years before cascading into a disaster in early 2018. So far, in the early going this year, nearly every rush hour commute has been plagued by delays on multiple subway lines, and the MTA’s subway action plan, as Nicole Gelinas recently detailed, hasn’t been a single dividend yet. Delays are, in fact, up since Cuomo announced this initiative. This is of course the well-covered transit crisis, but the city is suffering through another transit crisis as bus ridership and service reliability has been tanking in slow motion over the past decade. In fact, based on trends through the end of October, without a massive influx in riders in November and December, average weekday bus ridership for 2017 will be below 2 million riders per day, a low mark not seen since the early part of the last decade, and a decline of over 170,000 riders per day since the high-water mark in 2012. Buses serve a key segment of New York City, and regular riders are less wealthy and more dependent on transit than the average subway rider. That ridership is cratering amidst worsening service and few are focusing on the issue is alarming. The report covers some familiar ground — New York city’s buses average, for instance, 7.4 miles per hour, slowest among the United States’ major bus networks and average speeds in Manhattan aren’t much faster than walking. In fact, thanks, in part, to these slow speeds, Manhattan has seen a 16 percent decline in ridership since 2011. Stringer’s report rightly places this decline in a larger economic context of shifting job centers as “residents of every borough are now more likely to commute within their home borough than to,” a reality the subway network cannot accommodate but one the MTA has not considered as part of a badly needed update to the bus network. I’ll come back to the issue of network design shortly, but first, a glimpse at how technology is affecting speed and service. Stringer’s report finds that buses are in motion only around half the time. Much of the travel time is attributable to waiting at red lights (21%) and waiting at bus stops (22%). Bus stops are, of course, unavoidable, but dwell times can be reduced through a pre-board fare payment system or all-door boarding. The MTA hasn’t definitively committed to such approach when it phases out the Metrocard over the next few years, but without this promise, buses will continue to be slowed down by the MTA’s own choices. Meanwhile, signal prioritization on major bus routes, a long-sought-after reward, has been slow in coming, as NYC DOT and the MTA have not coordinated particularly closely on bus technology. Truly dedicated lanes with aggressive enforcement should also improve speed and reliability. This is of course hardly a secret, but one worth hammering at every opportunity. Winding bus routes are indicative of a network in need of a redesign. In Budapest, the typical bus route does not exceed 25 minutes from end-to-end. There is a clear logic to this policy: the longer the route, the greater likelihood for delays to accumulate and cascade down the entirety of the line. New York City buses do not follow this standard. Routes can span nearly two hours and travel well over ten miles. In fact, the average local route in Staten Island is 10.6 miles and the average citywide is 6.8 miles. Of the ten longest routes in the city, four are in Staten Island and three are in Brooklyn. These ten routes are not only long, they are also meandering, averaging 13 turns each. Frequent turns along a route will slow down a bus, forcing it to wait for an opening in traffic and carefully maneuver onto a new road. This can be dangerous, as turns carry a higher likelihood for collisions. Most importantly, turns are indicative of indirect, slow routes that are riddled with detours. On dozens of the city’s routes—particularly in Staten Island, Queens, and Brooklyn—buses will intermittently exit a major road to do a quick loop around local streets. This can be infuriating for riders, who wish to get to their final destination as quickly and directly as possible. The MTA has, in fact, acknowledged the efficacy of straighter routes, stating that “bus service is more reliable when operated in a straight line than when many turns exist along the route.” Unfortunately, they too rarely follows their own dictum. Among the city’s 220 local routes, 38 feature at least 15 turns and 97 have ten or more. Ultimately, the report includes numerous recommendations across a variety of topics, and I’m hitting only the highlights in this post. I’d urge you to browse through the entire report and digest the findings. In the end, the current bus network is not designed to provide good connections to the subway and hasn’t been restructured to get people from where they live to where they work (or otherwise want to go). The technology to speed up buses lags behind global leaders in the field, and the MTA and NYC DOT haven’t committed to creating a bus infrastructure that will combat the massive ridership declines. Meanwhile, with regular bus riders making on average just $24,000 per year, this sagging infrastructure and collapsing mode of transit hits hardest those who can least afford another route home. So while the subway collapse is spectacular and very public, borne out through daily delays and the general frustration of a city at its wits’ end, the bus crisis is an insidious undercutting of the city’s most vulnerable. Stringer’s report garnered some headlines late in the fall, and it deserves to be rebroadcast, but are the right people listening? Are they ever? One table highlights the simple improvements that could speed up city buses outside of the slow SBS planning process. As far as bus improvement efforts go, I’ve long maintained that the city’s and MTA’s Select Bus Service is something of a charade. It has so far taken these planners four or five years to identify a route, plan the service, hold the requisite community meetings, bid out the work, build the infrastructure and launch service along what is essentially a glorified express bus line. This isn’t Bus Rapid Transit with fully dedicated rights of way and constant service; this is New York’s “we have to please everyone all the time but especially drivers” middle-of-the-road stumbling toward transit upgrades. From an assessment perspective, one of the frustrating elements has been the sheer lack of data made public about the success (or perhaps the failures) of the Select Bus Service routes. Are these improvements decreasing travel time while increasing ridership? If rides are faster, why? What is the effect of an SBS route on parallel local bus routes? Recently, in a report on the B44, some of these questions were answered, and the results highlight two simple reasons why buses are faster. We’ll get to those in a minute. The B44 was one of those long-drawn out SBS routes. It debuted in late 2013 along Brooklyn’s third busiest bus corridor, and it’s a success story in a vacuum. According to the report [pdf], travel times have decreased by 15-31 percent depending upon the time of day and ridership is up 10 percent. Traffic crashes are down as well. Meanwhile, ridership has decreased on the local buses by only four percent, suggesting that the SBS route is a net gain. We don’t know how overall local travel times are affected by the shift in service though so it’s tough to analyze the overall impact. Officials were pleased. 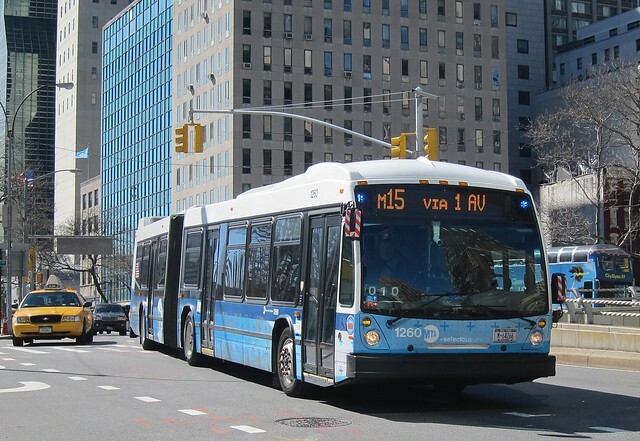 “The B44 SBS along Nostrand Avenue is a tremendous success story, among the biggest successes in the eight years that DOT and MTA have coordinated Select Bus Service,“ DOT Commissioner Polly Trottenberg said. But this is a lot of back-slapping for two simple infrastructure improvements. Overall, SBS B44 travel times have decreased by an average of 17 minutes, end-to-end, but times in motion haven’t changed. Buses move for around 37 minutes out of every hour, but instead of sitting at stations for nearly 26 minutes and stuck in traffic for 20, buses are stopped at stations for 15 minutes and stuck in traffic for only 12 minutes. Why? Pre-board fare payment, dedicated bus lanes and signal prioritization. It’s not exactly a secret combination, and improving bus service is as simple as that. DOT and the MTA have made better bus service into a big deal and something that warrants special consideration during the planning process and special treatment after. It involves branded buses, painted lines and special infrastructure. But it shouldn’t. It should just involve the recognition that buses shouldn’t be subject to the whims of surface traffic through busy corridors and that our fare payment system is horrendously antiquated and inappropriate for city buses. If DOT and the MTA wanted to, they could improve bus service tomorrow by significant amounts simply by giving buses their own lanes, and the fare payment problems should be a part of whatever comes along to replace the Metrocard. For all the handwringing about declining bus ridership and the need to expand transit access, the answers are right in front of our collective faces. That DOT and the MTA haven’t been aggressively pushing these measures is a stain on their records that deserves a closer look. Improvements and faster travel times don’t need to come through such a torturous process. DOT’s Mobility Report identified just show slowly buses move through New York City. Every day, the 8.5 million people who live in New York, along with numerous tourists and others journeying in for work or education or fun, have to get somewhere. We have to get to our jobs and our schools, our grocery stores and our parks, and our museums, plays and baseball stadiums. We take subways and buses, cars and taxis, bikes and boats. On some days, our riders are smoother than others, but by and large this transportation network gets us where we need to be. It’s not, however, all perfect, and lately cracks in a particularly vital segment have been on full display. New York City’s bus network seems to be hemorrhaging riders at a study clip, and although policy-makers have expressed concern over sharply declining ridership figures, they have not yet taken steps to solve New York City’s bus problems. A solution could require a major reconfiguring of how we prioritize traffic and street space, and current City and MTA officials haven’t been willing to dig in for a fight. If only it were that simple. As the population grows, mobility has slowed, and buses have been the biggest victims of slow speeds. The numbers are stark. In 2000, annual bus ridership hit 699 million, and that number held steady until 2010 when the MTA slashed numerous bus routes and generally reduced service throughout the city. Since then, and despite a rollback of some of the cuts, annual ridership hit 651 million last year, and there is no indication this trend will reverse. Bus ridership has been steadily declining since 2010. The report discusses the rise of cycling as a popular means of filling in holes in the transit network and solving many people’s last-mile problems, but it seems to lay the blame of the bus decline squarely on the shoulders of speed. Using BusTime data, DOT found that travel speeds in Manhattan, where ridership has sunk the most, are slowest, and in many spots, buses are traveling slower than a healthy adult can walk. For example, a westbound M42 averages 3.2 miles per hour between 2nd Avenue and 6th Avenue between 7 a.m. and 7 p.m. on a weekday. For many people, it is literally faster to walk. That bus speeds are so slow is no big surprise, but what can we do to fix it? The report indicates that speeds are the cause for a decline, but it falls short of identifying any cures. Generally, three issues create slow buses. First, the boarding process where riders dip their MetroCards (and often struggle with it) is slow and clunky, creating very long dwell times at stations. Second, buses are subject to the whims of the street. Without dedicated infrastructure, buses get stuck in traffic, and even in places where dedicated lanes do exist, enforcement is spotty. Queue-jumping technology, or signal priortization, was supposed to be a part of the city’s Select Bus Service offerings, but it still hasn’t been rolled out. Add it all up, and you get slow buses. From where I sit, fixing the buses would involve a massive philosophical change in which pre-board fare payment is the norm rather than a feature of a souped-up express bus. It would involve rethinking the bus network to ensure that buses provide connections between where riders are and where they want to be. It would also require a major push to bring dedicated bus lanes to far more areas of the city. Buses shouldn’t be a secondary mode of transit, subject to congestion; buses should get priority over surface congestion. Ultimately, if the city is serious about eliminating congestion, especially in Manhattan, the answer will be some form of pricing model, but that will lead to the need to invest in buses. And to do that, the city has to start respecting buses. Otherwise, they will be forever stuck in traffic, inching slowly down their routes, sometimes faster than walking, usually slower than biking, and always a second-class mode of transit. The first of the MTA’s new wifi-equipped buses hit the road yesterday. A few months ago, Gov. Andrew Cuomo called them “Ferrari-like,” and he seemed awfully happy to be there at the unveiling yesterday. MTA CEO and Chairman Tom Prendergast called these new buses part of the “enhanced experience for our customers,” and the rhetoric around Millennials was kept to minimum. But what do they look like in the while? Sometimes, all you need is one photo. More on the new F express plan later. I ended up spending the night in Chicago on business and am still working through the reaction to the MTA’s proposals.